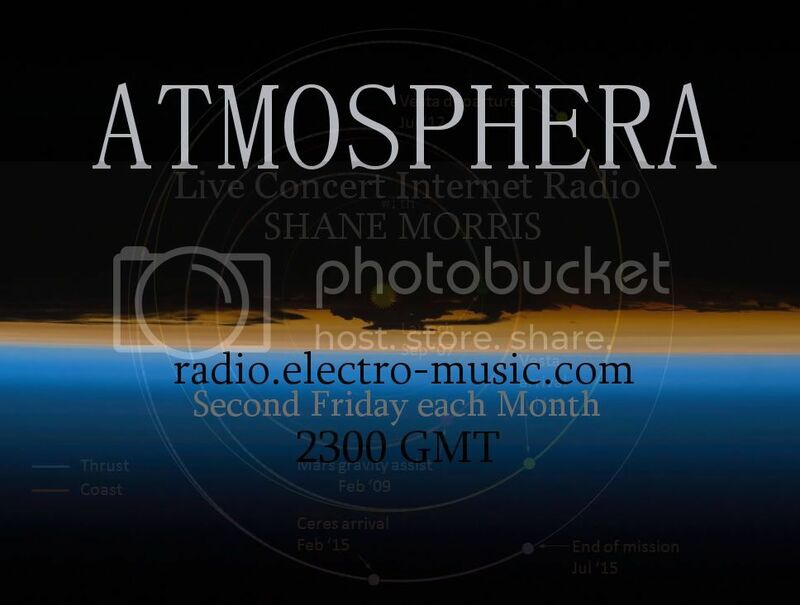 Atmosphera is a live performance journal by ambient/electronic artist Shane Morris. Each Atmosphera is mix of improvisation and structured sounds using a variety of electronic and acoustic instruments, blending ambient, world, and electronic styles. Please Join us in the chat room as well! I am glad to hear that your adding musique concrete to your musical sytle or at least more of it I hope. I have always enjoyed that genre. Thanks so much for the warm welcome! I appreciate that guys! I'm looking forward to returning onair. Bill, the chat room brain-storming session was very lucrative! thanks for persisting... was no harrassment at all! in fact... I plan to use some of the names for show titles as well. Thanks to Thomas Peter for throwing out the new title of the show as well! Shane, sounds great. Look forward to listening! so this is definitely weekly then? Wonderful show! I couldn't get on the chat room because it was telling me it was full. Very nice indeed, good to hear some new musical ways too! Great start to a new series of shows! Yup, I fell asleep in my chair to it, that's about the highest compliement I can say! Atmosphera ~ Episode 1 "The Crepusucular Mind"
Episode 1 was mostly based around a patch in the Alesis Qsr that I have been working on for a couple of weeks... arpeggiating a mix of bells, pads, and chimes sounds. Additionally, I used the Roland Juno 106 and the Roland MC909 a bit as well. I also was running apps Synthpond and Droneo in the itouch as well as a couple field recordings. Aside from the field recordings, this set was completely improvised live. Thanks again to everyone that listened in and/or was hanging in the chatroom. It's great to return to the streaming airwaves! Atmosphera ~ Episode 2 "A Liminal Space"
Tonight's performance will be a voyage through soundfields that reflect a liminal state of time, a transitory period between two shifting states. Atmosphera ~ Episode 3 "Going against the Grain"
Tonight's show will be juxtaposing granular and glitchy processing against atmospheric and dronal textures. As drones and atmospheres tend to be background, pleasant, comfortable, and sedentary... glitch and granular sounds tend to be foreground, disruptive, and transitory. I will be exploring the territory between these two opposing forces, combining them together into layers of sounds. any plans to post these shows Shane? Looking forward to tonight's show Shane! Jez I won't be posting these shows on the forum. Eventually I will be releasing them in some format or another... but not for a little while.